Everything in healthcare is becoming more connected—from medical devices to images to patient records. As a result, forward-thinking healthcare IT leaders are working feverishly to transform their digital infrastructures, with the hope that embracing the Internet of Things (IoT) will catalyze their clinicians into using robust data for improving both care and operational outcomes. Taking a step back, it is important to better understand the full potential power of IoT in healthcare. Harnessing the data generated by connected things and applying intelligence from the device all the way to the cloud can accelerate business transformation, improve patient engagement, lower costs and create efficiencies. But first, healthcare organizations need to get better at collecting, analyzing and storing IoT-generated data for the real-time decision making – so the meaningful data will ultimately make a difference in the patient care continuum. What are the most important factors healthcare organizations should keep in mind as they move forward their connected health transformation vision? And what products, partners and services can help generate new actionable data to connect the complex world of operational technology with the structured world of information technology? This brief but informative podcast—featuring Steven Lazer, the Global Healthcare CTO in the Healthcare and Life Sciences business at Dell Technologies, and David Ryan, GM for the Health & Life Sciences Sector at Intel Corporation—explores the current impact of IoT in healthcare, analyzing the path forward and sharing recommendations to realize value today and strategically plan ahead for what is coming next. 1. The current state of IoT in the healthcare industry, discussing specific client use cases. 2. Notable trends as healthcare organizations start to implement their early IoT projects. 3. How healthcare IoT will generate significant value and deliver ROI in the short and medium terms. 4. Best practices for minimizing risks while getting started, given that IoT devices are likely already on your network. 5. 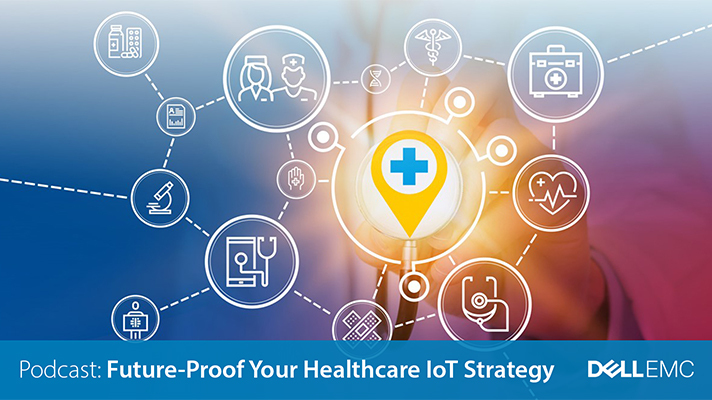 The technology required today to future-proof your healthcare IoT strategy for tomorrow. Visit Dell EMC for more on moving healthcare IoT from idea to reality .